Sticks and Stones is an awkward, burly, powerful, steep climb up a wavy hand/finger crack in a flare – and that’s only the crux first pitch. Old-school 5.10a, it’s a great reminder that it’s not only old 5.9+ routes and offwidths that can be sandbags. The one big detractor from this great route is a short, nasty, slimy, wet section through a thorn bush (thorns in Tuolumne?!?) on the first pitch. This section has a micro-spring that is wet even in the driest years. 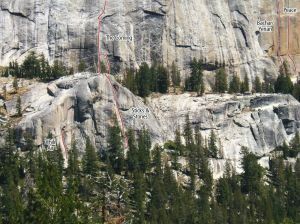 The second pitch is an ominous offwidth to chimney, but it’s way easier than it looks and pretty mellow, especially for wide cracks rated 5.9 in Yosemite. The final pitch is stellar 5.8 up intermittent cracks and knobs in a shallow corner. The wet section through the thorn bush detracts greatly from the star rating of the climb. A 3.5” and a 4” cam can be used in the wet area. The wide crack of the second pitch is not that bad, and has a huge knob to hang out on before tackling the wide crack crux. The last pitch has intermittent, but solid, small pro protecting fun knob, flake, and dihedral climbing. Which SuperTopo guidebooks include a topo for Sticks and Stones?